3,000 die each year from foodborne-related diseases. 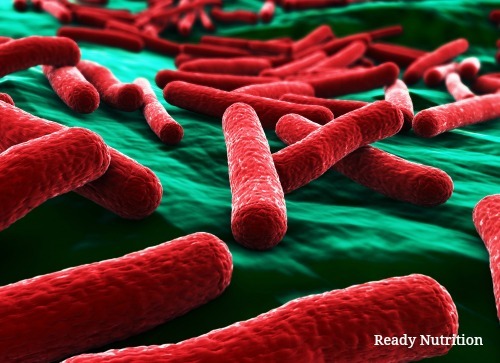 Get the low down on how to prevent these nasty critters from making a home in your gut, as well as, various pharmaceutical and naturopathic measures for dealing with the foodborne illnesses. Good Day, Ready Nutrition readers, and welcome to Part 2 of the series covering the challenges posed by Food borne illness and diarrhea in a conventional setting, wilderness area, and a grid-down SHTF scenario. Our concentration is going to be heavy on the latter two, as they are experienced in similar fashions (primitive conditions and surroundings). We outlined the categories in the last article. Let’s discuss the environment one will face. Tularemia (with the causative organism being Francisella tularensis is also known as rabbit fever. It is an arthropod-borne infection [see the previous posted article entitled, "Wilderness Survival: Preventative Measures and Off Grid Treatment for Deadly Bugs,” by yours truly], transmitted by fleas, ticks, and deer flies. Although these arthropods are the vectors (transmitters), the disease is within the meat if improperly cooked. The drugs of choice are Streptomycin, and Gentamicin. Catnip (Nepeta cataria) is a nervine herb that reduces fever and relaxes the patient. It can be taken in tea or capsule form and found in your local health food concerns. Up to 3 cups daily can be taken, but pregnant women must avoid it. Really good article, people need to pay attention to this stuff.